John had followed a bad path, drifting in and out of trouble, sent to improvement schools, a young offenders' institution, and, finally, to prison. He was on self-destruct, and believed that nothing and no one could help him. But when he was viciously attacked by a notorious train "steaming" gang, he knew he had to take the witness stand. The evidence he so bravely gave helped put his attackers behind bars, but just as it appeared that he was turning his life around, Fate dealt him another blow. Overnight, John Tovey went blind. He lost everything: his sight, his job, his home. Frightened and alone, he turned for help and, thanks to Guide Dogs, found himself partnered with a bouncy black labrador named Dez. Dez brought color and meaning back to John’s life, and slowly he learned how to live again as he and his loyal dog stepped out of the shadows and back into the light. It was a perfect partnership, and in 2012 Dez won the coveted "Guide Dog of the Year Award." 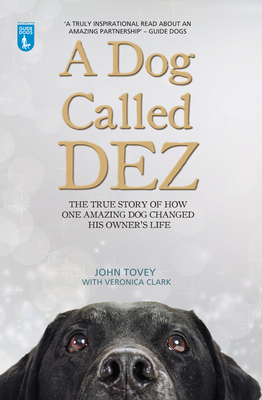 A Dog Called Dez is the inspirational story of one man's redemption though his four-legged guide. It not only follows John's remarkable life, but also shares the moving story of how man's best friend taught him to love life again. John Tovey was matched with a guide dog called Dez after losing his sight at age 42. John and Dez are both active fundraisers for Guide Dogs and to date, have raised thousands for the charity.